The DATAGONE is a fully automatic degausser for Hard Drives and Backup tapes. It uses pulse discharge technology and is fully processor controlled which enables the DATAGONE to offer a complete and secure erase on magnetic media. Media that can be degaussed includes Hard Drives that use both perpendicular and vertical recording techniques and most common backup tapes including DLT, LTO, 8mm, DDS and more. The entire erasure process takes approximately 8 seconds. 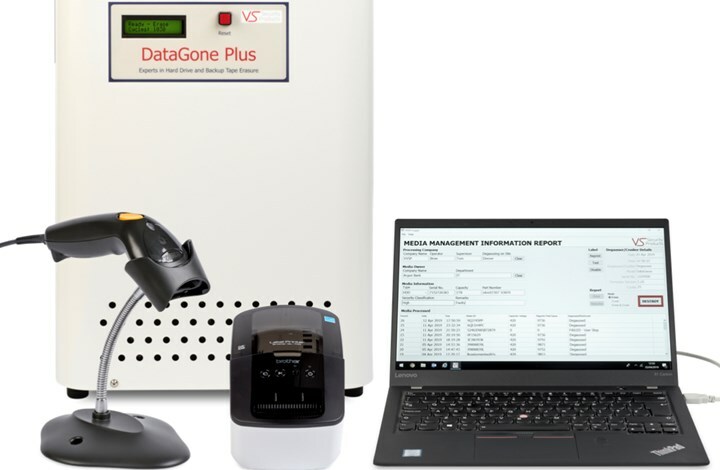 The DATAGONE generates a powerful magnetic field and in less than a second completely erases the complete data from Hard Drives and Backup tapes. Its simple one pass fully automatic operation makes it ideal in businesses where security is of the utmost importance. The DATAGONE is a fully automatic table top mounted unit. With the Datagone powered up the operator simply slides the hard drive into the aperture on the left hand side of the unit. The unit senses the presence of the media and the degauss cycle starts automatically. No operator action is required. When the degauss cycle is complete, the hard drive is released and exits from the degausser on the right hand side. Throughout the entire degauss cycle the onboard processor monitors the procedure and progress messages are displayed on the LCD panel. If the degauss cycle is interrupted for any reason such as power loss or any fault condition, the media is retained in the DATAGONE and the operator is immediately alerted to the interruption in the erasure cycle on the LCD panel. To eject media when the cycle has failed for any reason the operator has to press the reset button. This releases the Hard Drive or Tape and resets the degauss cycle. The operator should then attempt a repeat erasure. The entire erasure process takes approximately 8 seconds. Who Recommends Hard Drive Degaussing? Note: After degaussing, hard drives should not be not be reused as they are stressed in the erasure process. Some backup tapes may not be reusable after degaussing due to the servo track being erased. degaussers, degausser, data security, media destruction, hard drive destruction, magnetic tape, hard drive destroyer, degaussing, erasing, hard drive bender, hard drive.